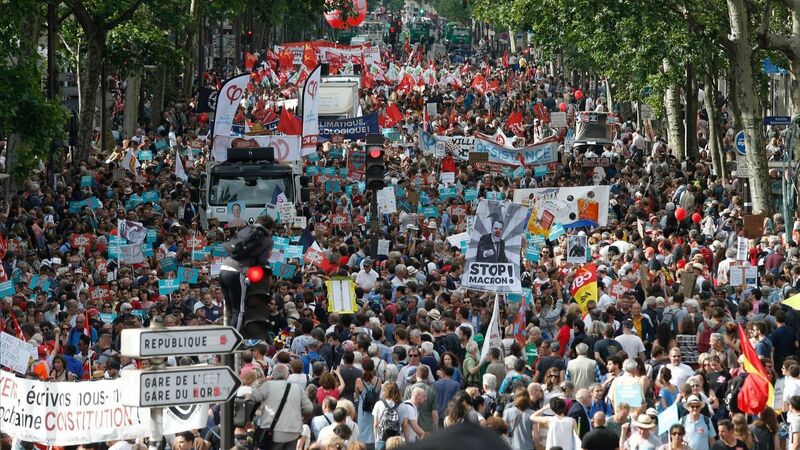 PARIS: Thousands of protesters marched under tight security in eastern Paris on Saturday after French labor unions, left-wing political parties and civil rights groups called for “floods of people” to oppose the economic policies of President Emmanuel Macron. More than 1,500 police officers were mobilized in the French capital to prevent activists not associated with the official protest from disrupting the march and causing damage, which has happened during previous recent demonstrations. Police said they detained 35 people in Paris before and after the march started. Some of them were preemptively taken in for questioning after officers searched their bags and found “equipment” that could be used to cause damage or to hide their faces. Others, mainly youths dressed in black with their faces covered, were detained on the sidelines of the main protest for breaking a window at a business or damaging bus shelters. Police used tear gas canisters to push them back. One officer was slightly injured by thrown debris. Unions, opposition parties and other groups are particularly denouncing a Macron-led legal overhaul aimed at cutting worker protections and increasing police powers. They allege that Macron supports tax reform that favors France’s wealthiest and is working to tear down public services, including by making it harder for students to attend the universities of their choice and easier for police to brutalize residents of disadvantaged neighborhoods. In the southern port city of Marseille, Jean-Luc Melenchon, leader of the far-left Defiant France party, also addressed Macron while speaking to demonstrators. “In the name of the poor, the humiliated, the homeless and the jobless, we are telling you, ‘Enough, enough of this world,'” Melenchon said. “No disorder will stop me, and calm will return,” Macron said.